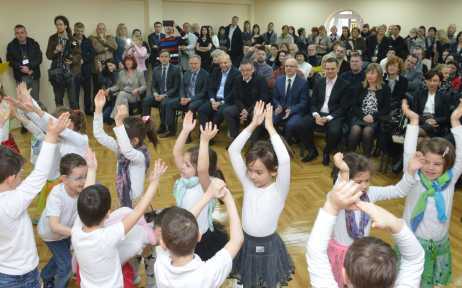 Mayor of the City of Novi Sad Mr. Miloš Vučević attended the official opening of the “Fairy” Kindergarten of the Radosno Detinjstvo Preschool Institution, in Radnička Street, whose construction had commenced in 2012. The facility is over 3000 m2 large, and can accommodate approximately 300 children. Along with the children, their teachers and the Head of the Institution Ms. Mirjana Đurđev, the ceremony has been also attended by Members of the City Council, as well as numerous other guests. - I am particularly proud that after four years of its announcement and three years of construction, today we open a new kindergarten, at our children’s and their parents’ pleasure. Functional area of the kindergarten is quite large, all the rooms are fully equipped and ready to accommodate 300 children. By opening this kindergarten we shorten the enrollment waiting lists. I am glad that the City, through its Education Administration and other Public and Public Utility Companies, executed everything that has been planned. 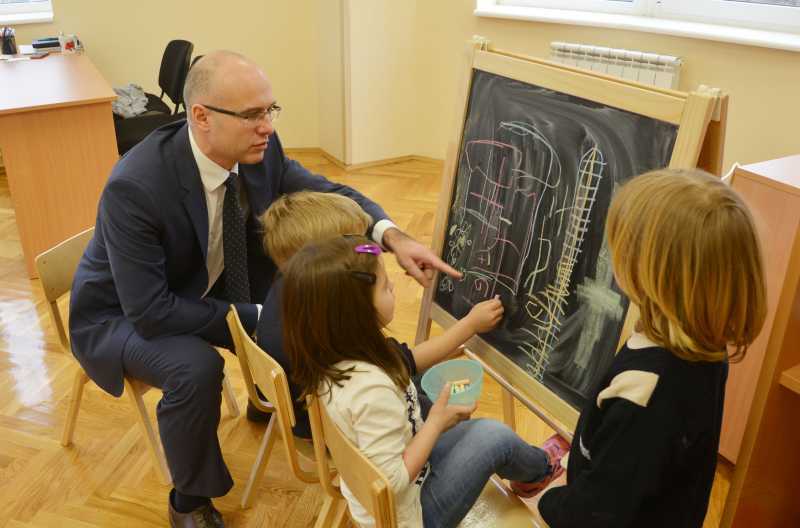 What awaits us now, is also the opening of the annex-upgrade of the Petrovaradin kindergarten, where some 150 children are to be enrolled, as well as the brand new facility in Veternik. I truly hope that, following these openings, we will solve the problems regarding the waiting lists. In addition, the City of Novi Sad as a municipality which pioneered the idea in Serbia, will not give up the accommodation subsidies for the children enrolled into private kindergartens. Our goal is to urgently enroll the children on the waiting lists and who currently do not attend any kindergarten. The novelty, of which we are particularly proud, is that this kindergarten will also be accommodating children aged only six months. – emphasized Mayor Vučević and thanked all those who participated in this project, as well as to the previous City Administration for commencing the construction of the kindergarten. Member of the City Council in charge for Education Mr. Vladimir Jelić stated that for the construction of the “Fairy” Kindergarten the City allocated little under 200 million RSD, from which some 171 million RSD were spent on construction itself, while 20 million RSD for equipping of the facility. 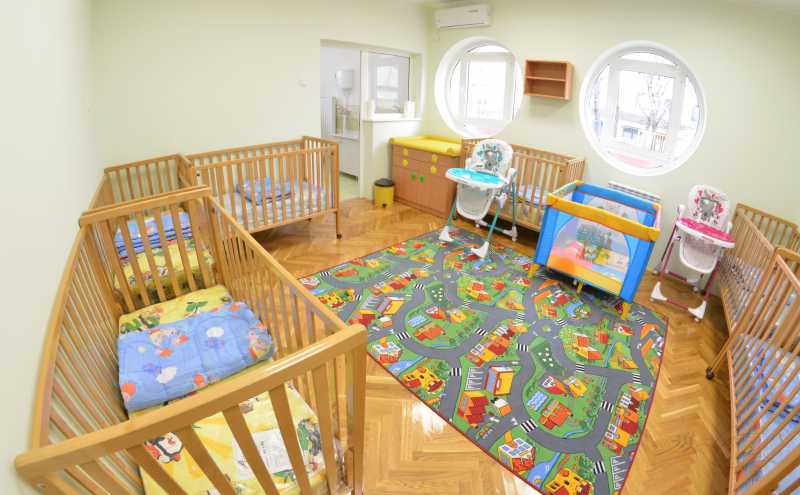 - The kindergarten will accommodate 300 children, in 9 nursery-crib groups and 11 groups for the age from 3 to 7. Out of 17000 children in Novi Sad, some 1300 are still on the waiting lists, which makes it around 7 percent. It is our plan that until the end of this year we enroll every child, and at the same time solve the problem which has plagued our City’s kindergarten system for several decades. We will realize this in three ways. First, we will open three new facilities – in Liman, Petrovaradin and Veternik – thereby providing space for 500 children. Secondly, we will increase the capacities of private kindergartens which will be subsidized, thereby additional room for some 400 children. Lastly, we will tighten the control of attendance, thereby enabling to enroll new children instead of those who are unjustifiably absent for several months. I am particularly glad to see that numerous other municipalities begin to follow our example in solving this problem, such as Belgrade, which starts subsidizing private kindergartens from September. – said Mr. Jelić.